Here are the fundamental stages of the history of the site “City of Vicenza and the Palladian Villas of the Veneto” starting from its entry in the World Heritage List (1994). U4V•MAG is focusing on the various moments that have marked the so called “relationship crisis” between UNESCO and Vicenza. UNESCO – United Nations Educational, Scientific and Cultural Organization – the purpose of the organization is to promote peace and understanding between nations, through the means of education, science, culture, communication and information. It fosters the “universal respect for justice, for the rule of law and for the human rights and fundamental freedoms” which are affirmed for the peoples of the world by the Charter of the United Nations. 1. Vicenza represents a unique artistic achievement in the many architectural contributions of Andrea Palladio, integrated within its historic fabric and creating its overall character. 2. Palladio’s works in the city of Vicenza and in the Veneto, have exerted exceptional influence on architectural and urban design in most European countries and throughout the world.Inscribed to the World Heritage List are twenty-three buildings attributed to Palladio, located in the historic city center, as well as three Palladian villas extra muros. ln 1996 further sixteen Palladian villas located in Vicenza province were included in the UNESCO site extension. Vicenza becomes one of the UNESCO sites having the greatest number of protected monuments: as many as 47, including the entire historic city center. ln 2001 a group of citizens organized as Committee for the Protection of the Historic City Center, coordinated by Francesca Leder, write to the National Commission of Italy for UNESCO in Rome. Subjects of the concern and report are the impending projects for multistory parking in Viale Eretenio and in the area known as “ex Macello”. ln 2005 in Durban, South Africa, during the 29th session, ICOMOS (International Council on Monuments and Sites) examines the documents pertaining to the construction of Valdastico Sud (Motorway A31 Southern tract), work brought to attention thanks to the denunciation issued by Italia Nostra Medio e Basso Vicentino led by Antonio Verlato at first and then by Alessandro Negretto.The director of the National Commission of Italy for UNESCO, Giuseppe Puglisi, declares that the motorway extension puts at risk Villa Saraceno di Agugliaro, work of Andrea Palladio. During the conference the problem of the chaotic unplanned sprawl of the areas under examination, which causes an uncontrolled development in the whole Veneto region, is clearly denounced. ln 2006 in Vilnius, Lithuania, ICOMOS “recognizes the authorities efforts in setting up specific protective measures, and praises the progress made in directing the attention of the 2005 commission with a series of technical solutions to purposely limit the visual impact of the motorway”. In 2007 the first petitions sent by private citizens regarding the new military settlement to be built in Vicenza (US Military Base Dal Molin) reach the offices in Rome. On February 2nd, the «National Commission declares to have opened an investigation, assuming that the military settlement already existed for decades and that the new installations are close [near the old, pre-existing one, the so called “enlargement”, Ed. Note] but anyway outside of the historic city center». 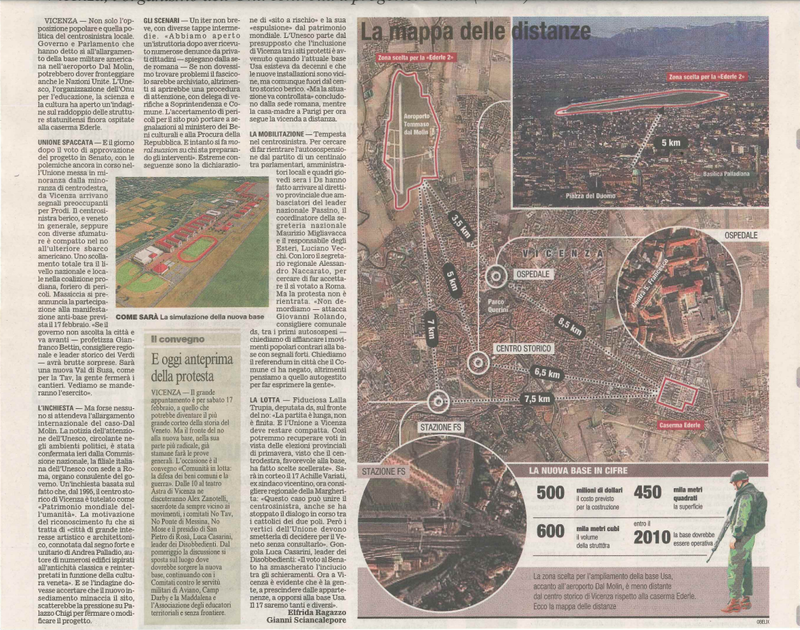 The article in Corriere del Veneto shows photographs of the project with distances offset more than two-fold and one begins to realize the ambivalent game of vicinity-contiguity declared by the Italian authorities, as well as the non direct involvement of Paris. In 2009 ICOMOS is still waiting to receive updates on the indications given in the previous sessions. Worried by the progress of the motorway Valdastico Sud works, they request that the Local Authorities present the final version of the management plan by February 1st, 2010. This should include the conservation plans and the buffer zones of Villa Saraceno. ICOMOS also asks to stop the works until a review and an analysis of the modified projects will be performed. While ICOMOS is evaluating Valdastico Sud / Villa Saraceno matters, the topic of the US Military Base Dal Molin reaches to the offices in Paris via the 2007/2010 VICENZA OUT OF UNESCO petition delivered by Alberto Peruffo to the Presidence, directly to Metchild Rössler. Said petition is a dossier with more than 1000 signatures of private citizens (first signatory Mario Rigoni Stern). Enzo Ciscato and Annetta M. Reams, citizens of Vicenza, send to UNESCO a detailed dossier titled VICENZA – ITALY, UNESCO HERITAGE – An update from the City of Andrea Palladio – Winter 2010. Alberto Peruffo sends to WHC (World Heritage Centre) the document Brogliaccio UNESCO containing testimonies from citizens of Vicenza on the military drift of the City: the US Military Base Dal Molin is at this point already built. The Brogliaccio denounces the negligences of the offices in Rome and Vicenza as well as of the contents and the conduction of UNESCO Seminary promoted by the Municipal Administration on February 18th, 2013. ALTRAECONOMIA (an influential national magazine) publishes an important dossier by Luca Martinelli titled l’Unesco fa la forza (Unesco is strength), that pictures the situation of Vicenza on a national scale, connecting it with other sites at risk. The dossier also documents the 2007/2010 OUT OF UNESCO petition and inspires the cover title of the magazine (issue n.150) to be ‘IF I LEAVE UNESCO’. 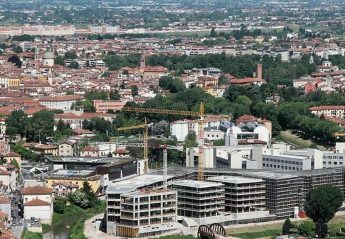 The Osservatorio Urbano Territoriale di Vicenza (OUT, Urban Territorial Observatory of Vicenza), through Francesca Leder, sends a note to the WHC (World Heritage Centre) denouncing the lack of an adequate preservation of Vicenza’s historic landscape. The note also informs of the progress being made on the project for an enormous residential and commercial building complex named “Borgo Berga”, situated in an area comprised between the Bacchiglione and Retrone rivers. Such location is reported to be very fragile from a landscape perspective, as it is South of the historic city center only a few hundred yards from the Palladian Villa La Rotonda, near the buffer zone. At this point UNESCO starts considering the matter Borgo Berga, ex Cotonificio Rossi. OUT (Urban Territorial Observatory of Vicenza), again through Francesca Leder, writes for the second time to the WHC (World Heritage Centre) informing on the impending approval by the City Council (effective as of January 13th, 2015) of the feasibility survey related to the upgrade of the railway line Milan-Venice (tract Verona – Vicenza) with the realization of a high-speed/high capacity railway (AV/AC). The project foresees the construction of a massive set of interconnected infrastructures in the area of Vicenza, inclusive of: the construction of two new train stations (one in the Exhibition area and the other in the area of the New Courthouse/Borgo Berga ); and the opening of a 1350x14x17m tunnel under the hill of Monte Berico, with an exit near the very well-known Villa Valmarana dei Nani (featuring Tiepolo’s frescos) very close to villa La Rotonda (part of W.H. – World Heritage). The issue achieves international importance and is, therefore, documented by numerous Italian and international publications. Metchild Rössler, Director of the World Heritage Centre, sends the ICOMOS Technical Review CLT/HER/WHC/8555/IT/AS/MR to the Italian Ambassador of UNESCO. The same ICOMOS Technical Review is delivered to the Municipality of Vicenza, who keeps it undisclosed and proceeds without any second thoughts with the urban projects already underway. The Council for Growth and Development of Vicenza calls a press meeting to disclose the news of having received from WHC copy of the letter sent to the Italian Ambassador of UNESCO. The letter, however, had been received by the City Municipality a good four months earlier (see February 2nd, 2016). The Municipality of Vicenza announces a call for tender for the award of drafting an Heritage Impact Assessment ( H.I.A) on the property “City of Vicenza and the Palladian Villas in the Veneto region”. Nine Associations and Committees of Vicenza notify the Municipality of Vicenza and the UNESCO that the H.I.A. competition notice lacks any criteria in act to avoid conflicts of interests for the parties bidding for the competition. The absence of such criteria could result in not granting the necessary independence from the Consignor, i.e., the Municipality of Vicenza. U4V publishes the complete Italian translation of the ‘ICOMOS Technical Review’ dated December 2015. The translation highlights in red the missing parts (for instance: dates, consignee, paragraphs, parties involved, etc.) as well as the “changes” of the literal meaning of terms present in the “non-professional translation” as given to the reporters by the Municipality of Vicenza on June 14th, 2016.